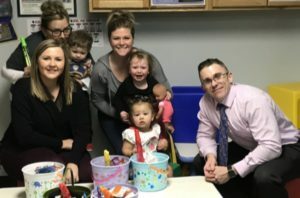 The Dismas Charities Kearney Nebraska program assembled and donated 30 “Spring” baskets and buckets to brighten the day of the children of the Early Head Start Program, operated by the Mid-Nebraska Community Action Partnership. Head Start provides child care -related programs to low income families for their children up to three years of age. Included in the containers were crayons, sidewalk chalk, bubbles, socks, small toys and snacks. Above Kearney Resident Monitor Gwen Graham (front left) and Director Jack Morgan (right) pose with children and staff at Head Start. The program later received thank you notes from the entire staff and children of the program.